Few cities in the world are situated in such picturesque locations as Bariloche. Surrounded by the Nahuel Huapi National Park, San Carlos de Bariloche is also home to the National Parks Administration, who have expressed a keen interest in using wind power for their park ranger cabins throughout the country. What is more, any solution that can improve the living conditions and reduce fuel costs for the park rangers can then also be replicated for others living within the boundaries of the National Parks, many of whom are of indigenous heritage and in the South, predominantly from the Mapuche nation.Their traditional lands are often very far from the current population centres, meaning that grid connection simply isn’t an option in many cases. Small diesel/petrol generators and kerosene lamps are the default solution for light and electricity, however in many cases, renewable energy can provide cheaper electricity that is available 24 hours a day. I first visited Bariloche back in May, when Wind Empowerment members, 500rpm, invited me to participate in their project that began back in September 2013 with a participatory wind turbine construction course in a local technical school. 500rpm take advantage of Argentina’s extended technical education, that allows secondary school pupils to specialise in technical subjects at regional centres, such as Colegio Tecnologico del Sur in Bariloche. They use this basic technical knowledge and the existing infrastructure (workshop kitted out with basic tools) to build capacity for wind turbine construction, installation and maintenance. Last year, they guided students and teachers at the school through the process of building a 2.4m Piggott turbine. When I arrived in May, they were planning to install the machine at the headquarters of the National Parks Administration, just down the hill with an ideal lake-front site. To help finance the project, they also offered a 5-day evening class for anybody with a keen interest in small wind to learn with a combination of theoretical and practical methods, including participation in the installation alongside the school pupils as an optional extra. The turbine was installed at the headquarters of the National Parks Administration, as they’ve installed a few wind turbines at park ranger cabins, but they’ve had a lot of problems with both the wind resource and maintenance. As a result, they were looking for a turbine that is more robust and that the park rangers would be able to maintain themselves, rather than wait for an engineer from the manufacturer to come all the way out to their remote cabin. Of course, they were also interested in how much power the machine would produce and perhaps more importantly, how this would vary over time (i.e. does it produce as much after a year or two as it did on the day that it was installed?). As a result, I asked Tom Dixon of V3 Power to build an Arduino-based logger capable of measuring wind speed/direction, battery voltage and current. In order to give a full understanding of the energy flow within the system, current is measured in 3 places: coming in from the turbine, going out to the dump load and going out to the loads. More details about this logger and the data it has recorded will be available here soon. The Arduino-based logger built by Tom Dixon of V3 Power is built around the DataDuino – a remote logger with a real time clock that uses the Arduino Uno chip to measure and record data to an SD card. The DataDuino was designed by Matt Little of RE Innovation, who recently designed a new shield to allow it to record data from two anemometers and a wind vane and operate for up to a year on three D-cell batteries. It just so happens that Colegio Tecnologico del Sur has a specialism in electronics and telecommunications, so were already working with the Arduino, as it is an open-source chip that enables people to write and share their own code freely amongst a growing community of users. I asked Matt to write a step by step to guide to building one of these stand-alone wind resource loggers, so that I could return to Colegio Tecnologico del Sur this September and run a participatory workshop on the construction and testing of such a logger. I ran the workshop as a one-off, one day event, with 17 students from 5th and 6th grade. I started with a half hour introduction to why its important to measure the wind resource, then handed out the instructions and kits of parts to three separate groups of students and once each group had turned these into a working logger, they took them outside to record some real wind. The day went remarkably smoothly, as the kids knew even more than I did about the Arduino itself, so it really was just a case of handing them the materials and watching them go! Matt Little explains all about the wind resource logger on his blog and as it is an open-source technology, the code and even the PCB masks are also available to download. Daniel Jarmillo attended the theory/practical course run by 500rpm here in Bariloche back in May because he has recently returned to his ancestral lands in the mountains around an hour away from the city. However, despite the national grid already running just a few kilometres away, the government has a policy of encouraging first nations people to move into town, so that they can provide them with basic services (such as electricity) much more cost effectively. As a result, Daniel’s community of Tambo Baez relies on candles, battery powered radios and torches and a portable diesel/petrol generator for power tools and incandescent lightbulbs. Daniel is interested in renewable energy to provide cheaper, cleaner power that is available 24 hours a day. Solar is an option, but the community is located in a steep valley, meaning that the hours of direct sunlight are significantly reduced. Wind is an option, as the valley looks out onto a lake, so if the wind blows off/onshore at this part of the lake, its possible that the valley could be a corridor for the wind. However, its also possible that its windy on the hilltops nearby, but that the valley itself is sheltered. Pico-scale hydro is on the cards, as a number of small streams run down into the valley. We were able to make some rough estimates of head and flow rate to determine the hydro resource and Daniel will continue doing these once a month or so to find out how it varies throughout the year. I also left a stand-alone wind resource logger with Daniel, so that he could measure the wind resource available at various points within Tambo Baez. Together with an estimate of the solar resource, Daniel will be able to work out the best combination of renewable resources to meet his and his neighbours demand and therefore whether building and installing a wind turbine really is a good idea. I visited Los Gigantes back in May, when we installed a 2.4kW Piggott turbine that had been built at a training course run in nearby Córdoba. We also installed an arduino based datalogger – see previous post. Unfortunately, the tower of the turbine that our sensors were installed on fell down a few weeks ago, so I arrived to find the anemometers and wind vane broken beyond repair. What is more, the new wifi enabled logger and extra current sensor failed to arrive in time before I left, so the planned upgrade also wasn’t possible. However, all was not lost and we were able to cannibalise one of the wind resource measurement kits that Matt Little had built for me and install a new anemometer on the tower of the new Piggott turbine, “El Pampero”. As a result, we were able to leave the system logging everything apart from wind direction. The lanscape and livelihood around Los Gigantes. Los Gigantes rural school and its spectacular surroundings. Marcos Angulo tidying up my messy installation. Testing the datalogger using its USB input for real time readouts. The new battery shed, complete with its new datalogging equipment. This development of this open source logger design is an ongoing project, with the installation of 3 further prototype energy loggers and 5 prototype wind resource loggers planned in the next few months. Stay tuned for more information! 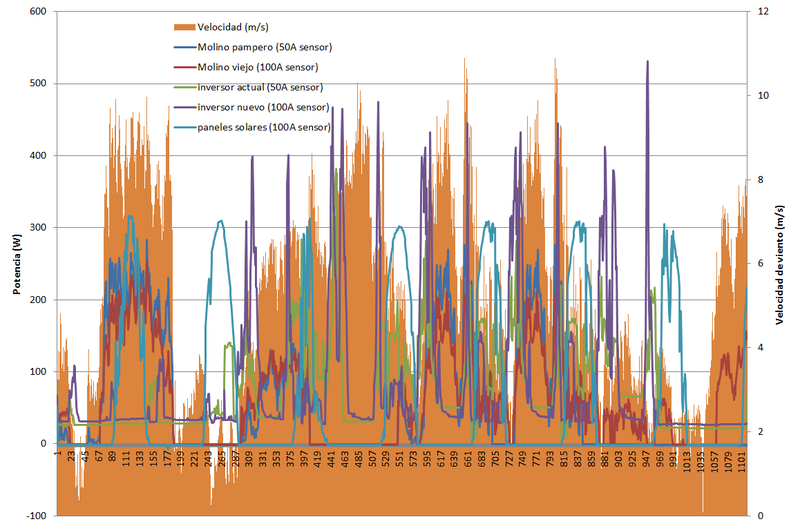 Time series plot of PV, Eolux wind and Piggot wind generation, wind speed and inverter power draws.